Well hello! Remember me? I feel the need to apologize, but it is what it is. In order to blog, I have to have projects. In order to have projects, I can’t blog for a minute. With a full-time job, I just don’t have time to do both every day. However, today I’ve got something pretty fun! I was in need of something “new” this fall, so I took to nature. In other words, my son had a leaf project due for school, so I gathered about 50 leaves for myself and came up with a little project of my own. Yeah well, now it’s this project. 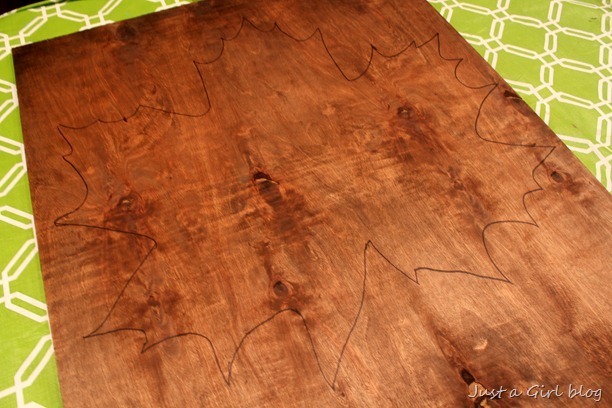 I flipped over the spider, stained the wood, and traced a large maple leaf onto it with my overhead projector. If you’re not sure a projector is necessary, I can certainly vouch for its use here and here. Love that thing. After drying out a bunch of leaves in between wax paper for a couple of weeks, I laid them into a sort of fan pattern within the leaf outline. It was looking pretty good. I grabbed some Mod Podge, a craft brush, and my cordless drill to hold things in place. Leaves don’t necessarily want to stick easily, but they were rock solid once they were dry. It needed to look as natural as possible, so I trimmed as little as possible. It just took a little more precision when lining up the leaf edges so they would follow the natural lines of the drawing. Of course a little stick from the backyard serves as a cute little stem (hot glued on). I also made sure that I didn’t glue the entire leaf to the board. I wanted them to stick out a bit. Anything too glued on would have looked weird. That’s my expert opinion, of course. I think it came together quite nicely with the other decorations I found. The same decorations that were missing for TWO years. When your husband says they’re not in the garage attic, just be prepared to go up there yourself to find them. Just sayin’. 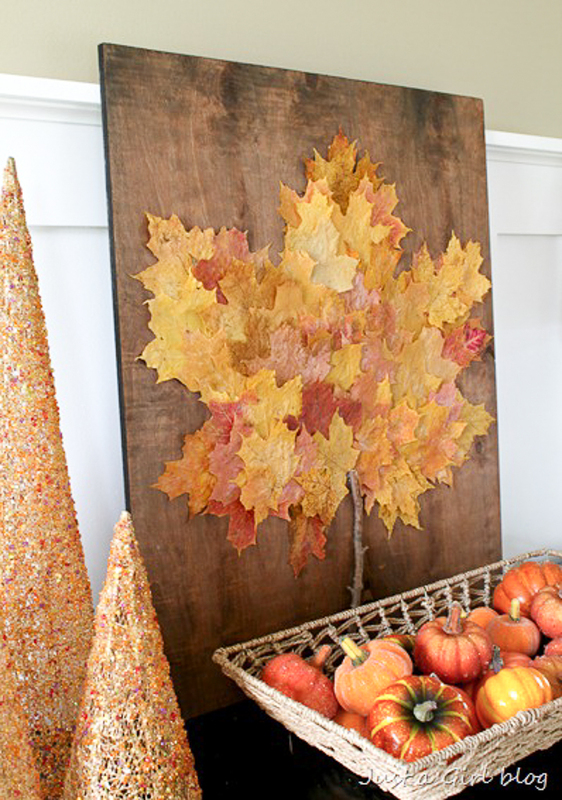 I L-O-V-E leaf projects, and it certainly helps that they are in abundance around here. How ‘bout you? 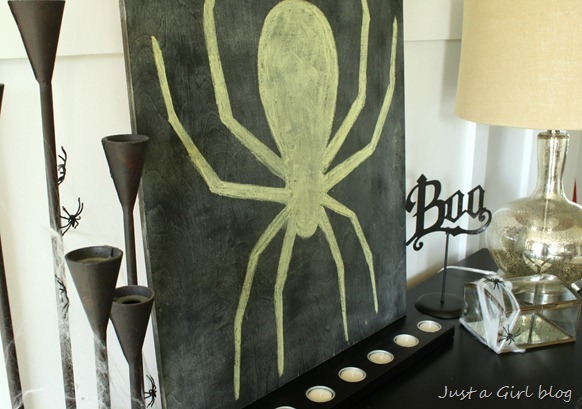 Do you have tons of “nature” around that you can use for free decorating? I love that! Next year I’m totally doing that – got to pin this so I don’t forget! Amazing! I am in for next year too! Love this. This turned out amazing! To bad the leaves don’t look like this in Central Florida. It’s a lovely idea. I love how that turned out! Pinning! That is a totally autumnal leafy leaf! I love it! 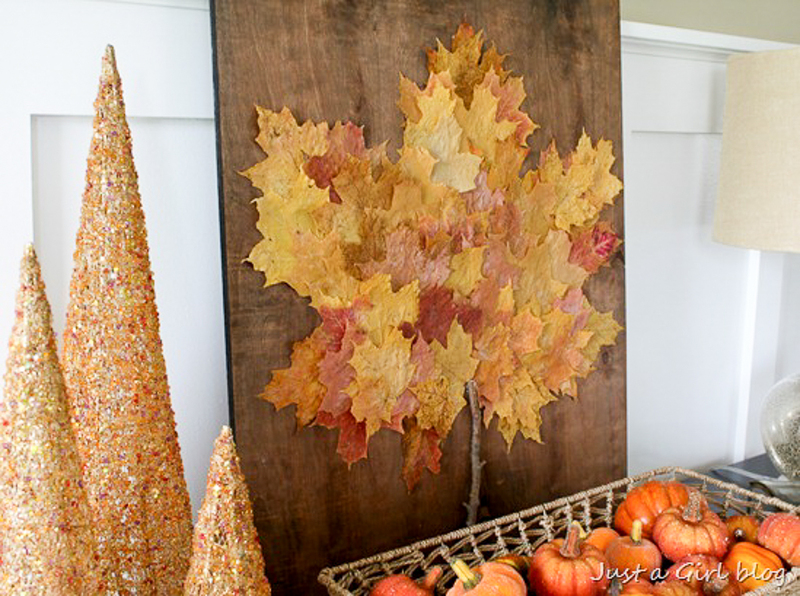 Your leaf wall art is gorgeous, looks so realistic. 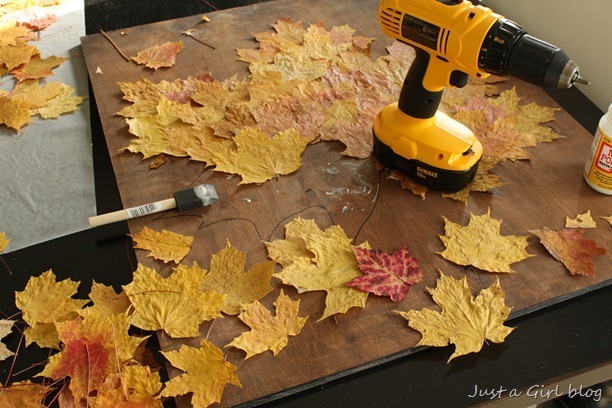 So smart not to glue the leaves down all the way. I”ve got to try that. 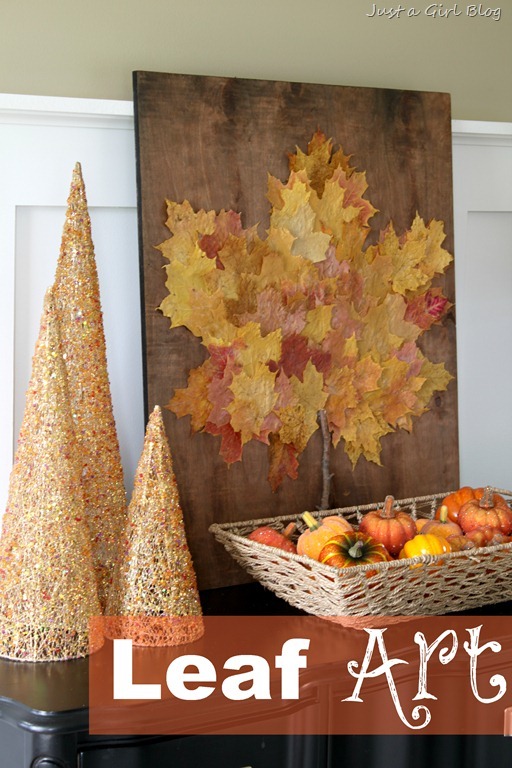 I also love leaves period and making leaf projects. As for husbands that say something isn’t where you’re pretty sure it is, well yeah they do that for whatever reason. Been there and had that done to me several times. So I just wait til he’s not around and go look for myself, usually find what I was pretty sure was there. Looks like your projector saved your day, great way to get an enlarged image on something. I could sure use one of those. Having something enlarged at a copy shop isn’t that inexpensive, at least not around here (west of Grand Junction, CO). We live out in country so I have to go a ways to get things done and half the time the place isn’t open or they don’t know what I’m talking about. If nothing else it forces me to be more inventive or make do with what I have. That is seriously so darling. What a genius idea. Not sure my leaf collection can stand up to yours, however. What a clever idea! It looks awesome!! I’m so glad I’m not the only one who has to juggle a FT job with blogging! I sometimes don’t have time for weeks to accomplish any projects – love how you say it is what it is. That is the truth. I work. I’m a wife and a mom. Then I blog. Thanks for making me feel normal! Great leaf project–advice. 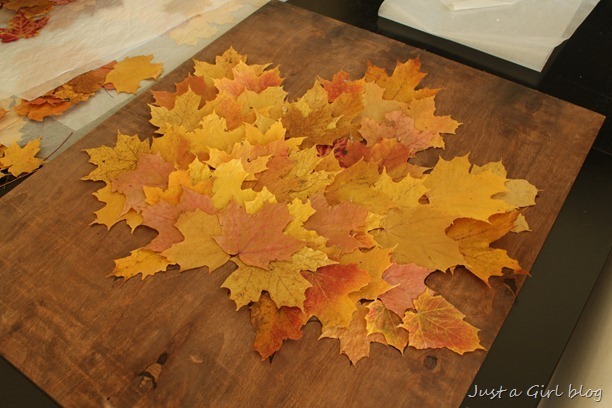 modge poge each leaf after it is dry then mount to the board–it will last for years and the leaves retain there color and softness as the day you collected them. Came out very cute, I was thinking of drying some leaves and framing a single leaf then grouping them together. Love it! Pinned it! What an awesome focal piece on a mantel! How lucky we are to live in Michigan :] Fall is one of the most beautiful times of year here and you managed to perserve it in such a inspiring design……..well done……….it will certainly be something I try for next year. This is a great idea, turned out awesome. Looks great! And I love how you used real leaves. I hear ya on the full-time job, no time for projects thing. Sometimes it’s exhausting trying to keep up. What a beautiful picture. I love the fact that the leaves are not completely flat. It looks so natural. Good job!! Beautiful. I’m pinning it for next year! Need to pin this one for next year. The leaf print is gorgeous! LOVE this! As well as all of your other creations. Your blog is a true inspiration. Wow – what a simple but beautiful piece. I’m sure we’ll be seeing it pinned and re-blogged everywhere. Well done. 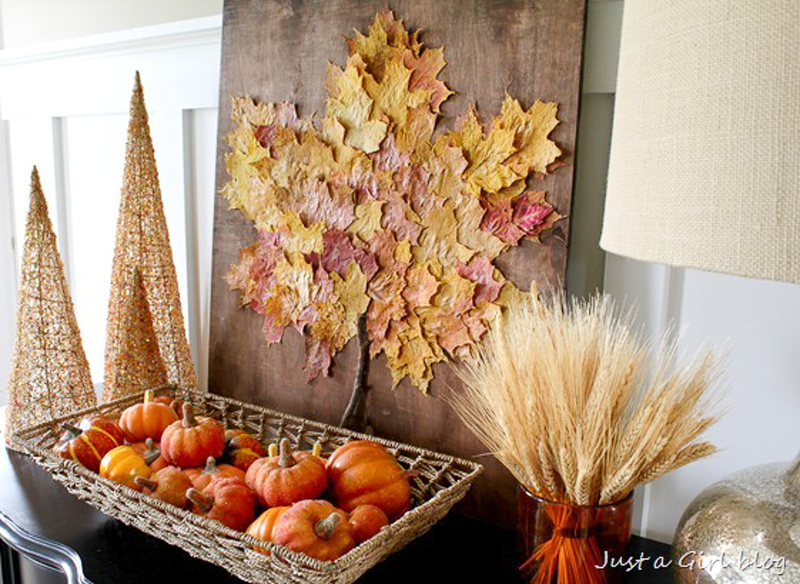 I was actually amazed with this DIY project of yours, you really did make sure of falling leaves around your neighborhood. Will definitely make one this too. This looks beautiful! I am just amazed at your creativity. Love this project.